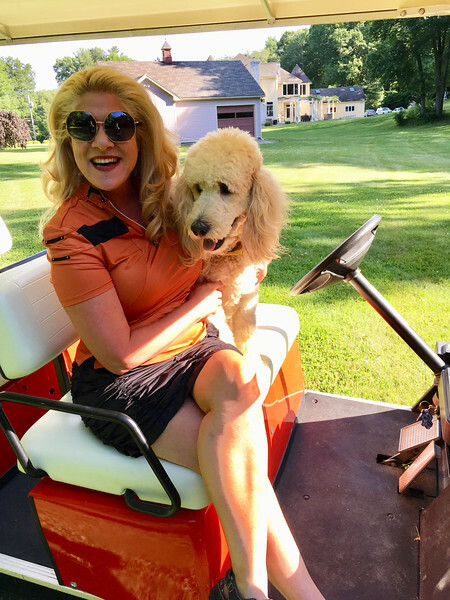 Gal pals forever: Coco loves her Red Sox golf cart, in which she drove Ms. Dacey around the golf course. She was extra-cautious so she wouldn’t be picked up by Chelmsford’s finest CPAL, who she loves and is always so excited to smooch, hug and lick! I’m dressed in traditional golf attire, wearing a rust-and-black DKNY golf shirt and a ruffled black ANNIKA Cutter & Buck Golf Skirt.